This time of year has brought to mind how transitional life is and how much change is inevitable. Perhaps this has been fueled by the loss of the dear friend I mentioned in my last article or perhaps it’s my own personal sadness that happens at this time of the year as the weather cools and the leaves begin to fall from the trees heralding the coming of Winter. It is at this time that I’m reminded of a line from Wiccan ritual, “…for all that dies is reborn once more…” and look with anticipation to the coming of Spring when the Earth will awaken once more and bloom, filling our eyes with brilliant color and our noses with abundance fragrance, awakening us to the joys and passions of living. There is purpose to our being here. No one life is without purpose, even if we have not allowed ourselves to see what our purpose may be, and no one life is more or less important than another. We have all come to do something that is important to our spiritual evolution. There is a part of us, the human part, that wants to be recognized for our accomplishments. Even as we reach adulthood, we want others to recognize that we are no longer children. Wicca, like so many other religious/spiritual paths, has these same rites of passage which acknowledge such events as coming of age, marriage, death and others as well. I can only speak from my own tradition of Wicca. Although I realize there are similar rites in other Wiccan traditions, they do differ just as there is a difference in rites between different denominations of Christianity. I would like to offer you an insight into the rites that we perform. Our belief is that a child should be given the right to choose their spiritual path so we do not immediately assume that a new baby that has been born into our midst will automatically become Wiccan. For this reason, we ask only for the Gods and Goddess of our faith to watch over the child until it becomes old enough to choose. This rite of protection is called Infant Blessing and is a simple rite where the baby is brought, by the parents, into the Circle and taken to the four Quarters and Center of the Circle where each direction is asked to guard and protect this being. God/Goddess parents are chosen and their function is to pledge to take care of the child should anything happen to the parents – much the same as the Godparents of Christianity. When the child reaches the age or 12 or 13 years, they are given the opportunity to choose. It is hoped that, prior to this time, they have been given and taken the opportunity to learn about other spiritual paths, excluding none. If they decide to become Wiccan, they are taken through a rite of Seigning where they choose a spiritual name which they will be known as inside the Circle and during any training that takes place. There is a Rite of Passage into Womanhood for females who have begun their menstrual cycle. The purpose of this is many-fold. It allows the removal of the dirty, bothersome connotations of this physical transition and also provides a means of making her aware of her womanhood and sexuality as it pertains to the Goddess. Although not mandatory, it is a beautiful rite that is attended by only women. The Male Rite of Passage is usually performed close to a boy’s 13th birthday. This is an all male ritual and, in modern times in this tradition, contains three tests: 1) Silence; 2)Endurance; and 3) Courage which is then followed by a rite of recognition by the other male adults. Once again, this is not a mandatory rite, but can be uplifting if the young male wishes to have it performed. If a young adult showed no interest in Wicca until the age of 16-18 or whose parents weren’t themselves part of Wicca until later in the youth’s life, can choose to have a Young Adult Dedication performed. Let me emphasize that this is for those whose parents are Wiccan. We do not initiate, dedicate or perform any other rites on those whose parents are either not Wiccan or who, being of another faith, have not given their written consent. Our tradition recognizes our training is for those who wish to become spiritual leaders and teachers- High Priests and High Priestesses. We have rites of Dedication and three rites of Initiation that are performed as the student begins and moves through the disciples and training to reach that goal. In most traditions, this takes at least a year and a day between each Degree of Initiation. We have come to recognize that each person is unique and quite individual requiring whatever time it takes to thoroughly learn and put into practice the training for each Degree. 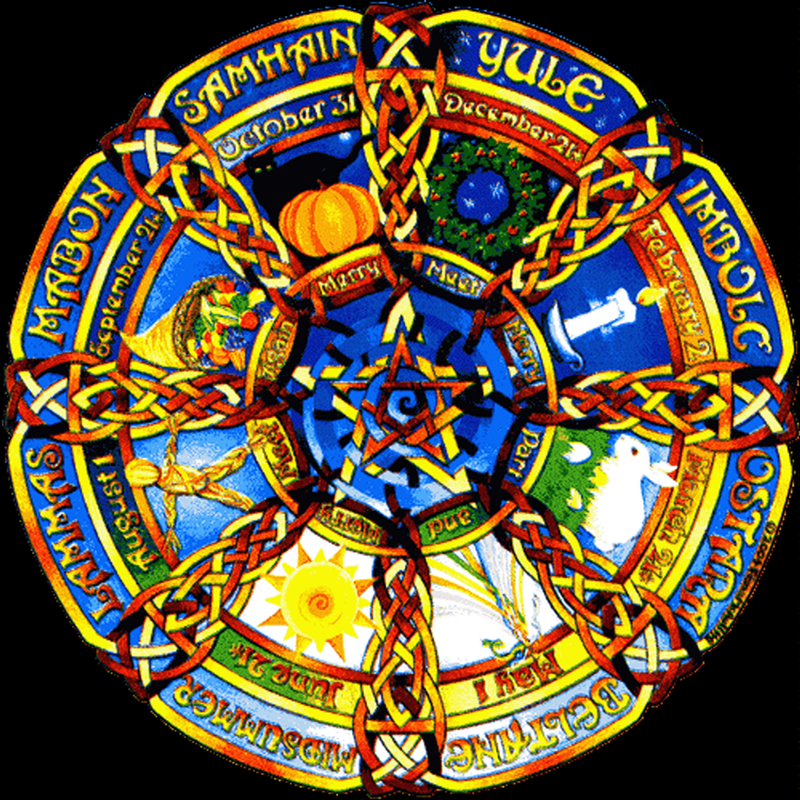 Other traditions of Wicca may have fewer Degrees or require less time to be taken. We celebrate the uniting of two people in love with a rite called the Handfasting. This is a spiritual rite and not necessarily a legal one. Unless a High Priest or High Priestess is recognized and licensed by the state they are performing the Handfasting in, it can only be spiritual. By tradition, since it is usually spiritual only, it is recognized as binding for only a year and a day. At that time, the individuals can go their separate ways or choose to have the rite performed again. Our tradition takes our part in this joining of two souls very seriously and, for that reason, do not consider ourselves available to just perform any ceremony. We recognize that there is karma in the adding of our energies to this rite so we want to get to know both people we will be uniting. This is especially true if you are a licensed minister and will be making this a more permanent situation. And if you divorce the person, is there a rite for that? Yes, there is. It’s called a Handparting, and usually only requires one of the two people to be present with an substitute standing in for the other partner. This is a rite of choice and, although there are standard written rites available, sometimes the best ones are the ones written by the person desiring the rite to be performed. Just as we want recognition in our youth for our growth and progress, as we enter our “golden” years, we would like to think we would receive recognition for the work we have done on this Earth walk by those we hold dear. For this, our tradition has an Elder Rite in which we honor those who have left their middle years behind and have either actually reached the age of retirement on the physical level or who have achieved some goal worthy of elder status. In either case, it means that we have attained our goal, completed a mission, and it’s no longer required of us to continue working as a High Priest or High Priestess, though we are free to do so, if we so desire. Elders are sought out for their life experience, wisdom, and counsel. When the time comes for us to leave this incarnation, we privately mourn the loss of friends and family recognizing the sadness is our way of expressing how much we will miss them. Our funerary rite is called the Bridge of Light. Most Wiccans choose cremation and during this rite their ashes are usually scattered. Publicly, we celebrate their lives. Many wear white, instead of black, to this rite and celebration, recognizing that it is a birth to another plane of existence. Much like a wake, there should be music and laughter with tales of fond remembrances of the loved one. Yes, change is inevitable…Spring turns into Summer; Summer into Fall; Fall to Winter and once again to Spring. We are born, grow, reach adulthood, live our lives, become seniors and then pass to a new existence. This entry was posted in Astrology and tagged Bridge of Light, Ceremony, Dedication, Handfasting, Handparting, Initiation, Magick, Paganism, Rites of Passage, Sacred celebrations, Seigning, Spirituality, Wicca. Bookmark the permalink. I think I failed to thank you for the nomination. Belated as it is, Thank you! Thank you for this information. I truly see something different this minute than I did 10 minutes ago.